Join the discussion on our forums! Come discuss Razorpetal Volley over in our dedicated Razorpetal Volley discussion topic. 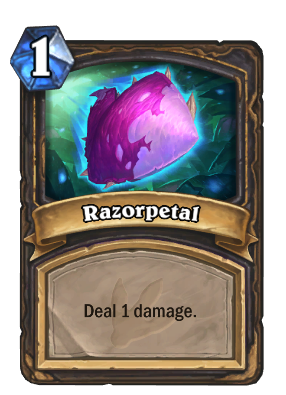 Add two Razorpetals to your hand that deal 1 damage. The result of a fundamental misunderstanding of the phrase "flower power". And... this card is a staple in Maly Rogue decks. In spite of people hating the card before this. LOL. Yup this card is bad as fk. Maybe it would have seen some play if it costed 1 mana instead of 2. I don't get why people are looking down on this card so much. There has been a lot of internal community discussions and suggestions for a card like this to be added to Rogue. Mana cost is perhaps steep(but 1 mana would make it crazy), but a good start. If you don't get why a card like this has been "asked for" for Rogue for a while, well, it's easy to see you don't really play Rogue all that much. I'll give you a hint: Combo and "Cards you played this turn" are two out of four reasons why it's been asked for. Even a fifth, though that would only concern the future design(for the designers) of a new archetype for Rogue. Is it realy that bad? I think not, in the context of rogue toolset in general. The strength of Xaril, Poisoned Mind is that he is 3 cards in one basicaly. This one is a bit worse for sure, but it is also 3 cards in one. I'd like to take back my "Bad" vote. Besides what you and others said, it could be good with Biteweed, too. So I'd say at least playable. I did that post before expansion launch and now, after playing with this card i can say that this is solid substitution for cold blood if you playing sherazin, arcane giants and questing adventurers (as i do). It is also due to big number of taunt minions introduced thus making leeroy + cb finisher sketchy in lot of situations. In this meta it's pretty hard to push damage without massive "meat" on board such as Questing or Giants. This card alone basicaly reduces mana cost of your giants by 3. Besides, tokens are pretty good against hunter and zoo. 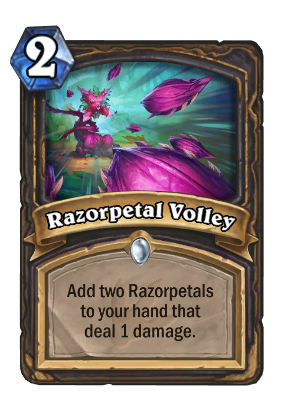 Also i found that new Razorpetal Lasher used in "popular mainstream decks" is actualy less useful than this card, and just worse than Shiv by all means except if played on turn 2 (completely dead topdeck, otherwise). I don't think that this card is fundamentally bad, Blizzard is just pushing a different type of Miracle Rogue, which utilizes a big hand rather than just Gadgetzan Auctioneer to recycle. I actually like this design better. I reckon this could see play in a wild Malygos rogue, since you'll only need a single tick from Emperor Thaurissan for a large amount of burst damage. and I don't think Malygos will be good, we dont have Conceal and the Coin from Tomb Pillager anymore. and dont forget all the poisonous things who's gonna get rid of him in no time. Probably the hardest card to evaluate in this set. 4 mana, give your hero windfury, immune, bypass taunt, and activate spell/cards played synergy is what runs through my head. Aside from it's obvious use as a combo starter, it's more fuel for Rogue's classic all-in plays. Teachers, Edwin, Questings, Auctioneers, etc. Could be busted or could be crap. Azure Drake rotating out hurts it a bit. 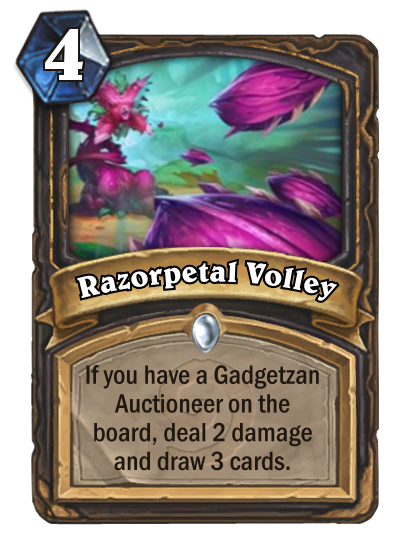 IMHO this will be better if this card itself deals damage first, then add another Razorpetal to your hand. That seems like the perfect way to buff this, so it could maybe remove an early minion alongside something else on its own. Razorpetal Lasher could probably use the same treatment. We need Information about the Token Card! Cmon Blizzard!